All Progressives Congress (APC) National Leader, Asiwaju Bola Ahmed Tinubu, says he remains ‘Gidigba (solid) in the party, despite the recent attack on the APC leaders at the Abeokuta rally in Ogun state. In the video, Tinubu was alleged to be seen throwing away the party’s flag at the presidential rally. ”If the issue of the flag has become the hotspot of the PDP campaign, then they are in serious trouble. During that portion of the Ogun rally, the National Chairman and others were looking for a party flag. I spotted one within my reach. I picked it up and attempted to toss it to the National Chairman, Adams Oshiomhole so that the Chairman can present it to the party’s gubernatorial candidate, Prince Dapo Abiodun. If you want to fault me for anything in this matter, your critique can only be limited to the accuracy of my toss. Any attempt to enlarge the episode beyond this is fiction and mischief writ large, ” he said. 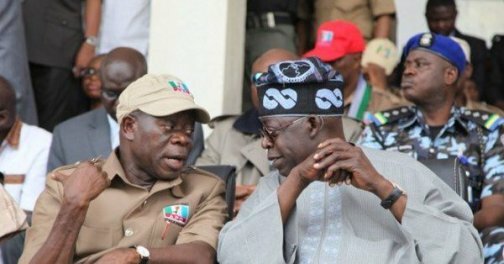 Tinubu said he was committed to the party and had been hard at work for the victory of the APC and all of its candidates in the upcoming elections. As the National Leader. It is unthinkable that I will leave the party. Moreover, there is no reason for me to do so. I understand the bigger picture. I know what is at stake in this election. Either the nation moves forward along the progressive path of the APC or it will be forced to retreat into the ills of the past created by the PDP. With the nation’s future hanging in the balance, I will not allow myself to be deterred by petty mischief. After the election, I will be there celebrating the APC and this nation’s victory over those who will prevent us our rightful future,” he said.